Nero Burning ROM of Ahead is versatile program and is even capable of burning so called BIN/CUE files. BIN/CUE files (files that have a suffix .BIN and .CUE) are often found on the Internet and commonly created using CDRWIN by Golden Hawk. But it would we a bit of a waste of money and disk space to buy 2 CD-writer programs, specially when the one you've got (Nero) can do it all. Simpely put, a BIN file is nothing more than an ISO file variant, as is a CUE file nothing else as an index file for the BIN file. Tip: If you only have the BIN file, and don't have the CUE file, then look in the downloads page where you can find a little tool called BIN2ISO to convert BIN files to an ISO file. I created a separate page on how to use this tool: Converting a BIN file to an ISO file. Look at the Burn ISO with Nero page on how to burn this image file (thanks to Hans van Helden for the tip!). So how do I write BIN/CUE files? 1. Check the content of a CUE file by opening it with NOTEPAD. Notepad can be started by clicking "START" - "RUN" and then entering "NOTEPAD" followed by an ENTER. Drag the CUE file on the just opened NOTEPAD so it's content will be revealed. Note: The filenames used in these BIN/CUE examples are very likely NOT the same names as you will see in your BIN/CUE files! 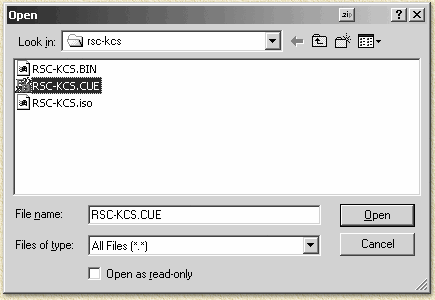 FILE "RSC-KCSB.BIN" BINARY The CUE file refers to the BIN file called "RSC-KCSB.BIN"
Track 1 of the CD is stored in Mode 2 and starts at the beginning of the CD. Why did we open the CUE file? What should I check for? Ocassionally, the "filename.bin" is written including the path, for example "C:\Temp\filename.bin". If in your situation the BIN file is not located in that same path, Nero will not be able to find it. Remove therefor the path. Below you see a WRONG CUE file, remove the path and save the edited CUE file by selecting "File" - "Save". 3. Choose files of type "All Files (*. *)" or "Images Files (*.nrg;*.iso;*.cue)"
Note: Newer releases (as of version 5.5.x.x) of Nero support BIN/CUE files instantly using the filetype "Images Files (*.nrg;*.iso;*.cue)". If you have such a version, then choose this filetype instead of "All (*.*)". 4. 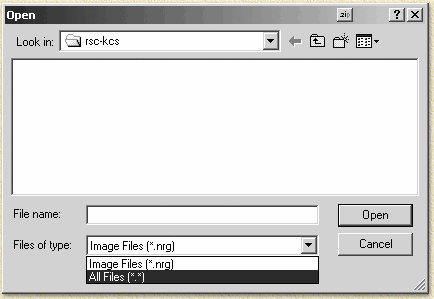 Select the CUE file and select "Open". By default Nero uses TAO (Track At Once). Well, that's all you need to do to write BIN/CUE files with Nero ... isn't it simple once you know how? Note: SOMTIMES Nero is complaining about some unknown trouble with your CDR or CDRW. Often this is caused by BIN?CUE files that cannot be burned with TAO. For that reason try DAO (Disc At Once)!